A powerful ancient Mayan ritual forces you to face your deepest fears—whether you like it or not. A modern Temazcal sweat lodge in Tulum, Mexico. On a recent trip to the Yucatan Peninsula in Mexico, I returned to Tulum and participated in a Mayan sweat lodge known as a Temazcal. Translated as “house of heat,” the ancient ceremony led by a shaman originated with the pre-Hispanic Indigenous peoples of Mesoamerica to purify the body and mind, heal the sick, or provide a spiritual haven for women to give birth. Now, given this was my third undertaking of the hotter-than-hades ritual, you might say I’m a glutton for punishment. To me, Temazcal is absolutely terrifying. It’s completely dark inside what appears to be a giant wood-fired brick pizza oven and there is no ventilation, nor is there any concept of exactly how long you’ll be trapped in there with no way out. On top of that, just when you think it can’t possibly get any hotter, it does, and you become so engulfed by plumes of copal-infused steam and clouds of shamanic smoke, that it’s no wonder you don’t suffocate. So, why on earth did I go back for more? My first two attempts at Temazcal took place in a nondescript community park somewhere deep in the Bronx, NY. It was a word-of-mouth ceremony led by a group of local shamans of Guatemalan-Mayan descent. Much like the rise of Ayahuasca ceremonies in New York and Los Angeles, this particular Temazcal was performed in secret, and you had to be invited in order to attend. There were no drugs of course, though the sound of gun shots could be heard nearby. I had no idea what to expect for my first Temazcal two years ago, and went in with a self-righteous air of confidence: I’m spiritual, I can handle the heat, I’m tough, etc. Before entering the makeshift pizza oven (in a public park in the Bronx, the lodge was constructed with large sticks and dozens of Mexican blankets rather than brick or stone, for easy disassembly), I lined up with about 15 other women for a pre-sweat blessing. A fire roared some 20 feet from the entrance to the hut, and I was even relieved to discover that it was not actually inside. We were smudged with sage and copal, and asked to set an intention for the spiritual work we were about to embark upon. I found myself somewhere in the middle of the lineup, which meant that as we entered the hut one-by-one, I would end up inside near the back, the furthest away from the door. And as soon as I became aware that escape was not a viable option, an overwhelming and unexpected amount of fear took hold and I started to panic. I kept my focus on the door as one-by-one, hot stones that had to have been about a thousand degrees each were brought into a deep, dirt pit in the center of the hut. It was getting hotter by the second and I had no idea just how many stones they were planning on bringing in. I wanted to bolt; I wanted to tell them to stop. Please keep the door open… please keep the door open… I pleaded to myself. And yep, that’s when they sealed the door and we were encased in total blackness. I took a deep breath as Yao, our female shaman, began chanting, and told myself over and over that I was tough; that I could handle this. But as she began pouring water over the stones and loud sizzles reverberated throughout our little oven packed with shoulder-to-shoulder bodies, for the first time in my life I became claustrophobic and nearly had a panic attack. Defeated, I asked to leave after just one round. As I sat outside and gazed up at the stars, I recall the clouds parting as a thin crescent moon loomed overhead, looking down on me, as though it were smiling. The chanting that echoed from the 15 or so women inside was so beautiful; so soothing and otherworldly—and suddenly, I felt that everything was going to be OK. At the start of the third round I asked to come back inside. I laid down in the fetal position and understood why our shaman referred to the hut as the “Mother’s Womb.” I was safe again, and so I endured the remainder of the two hour ceremony. For the very first time, I understood that I was battling with anxiety—something I had always been “too tough” to admit. It’s interesting how despite becoming aware of our old patterns, we continue to repeat them anyway. This particular Temazcal was intense—four rounds of 13 stones, also known as abuelas (or grandmothers), were brought inside the hut. Do the math, and that is one hot human pizza oven. A year later, I vowed to face those fears again and returned to the Bronx for another go at it. But this time I had certain requirements: that I sit right by the door, that I spend the entire time laying down in the fetal position, that I endure whatever fears come boiling up to the surface. I succeeded, yes, but in hindsight I realized that I was not actively participating in receiving the medicine of the ceremony. My intentions were still fear-based, and I was not truly healing. So now you might understand why I had to try Temazcal again. 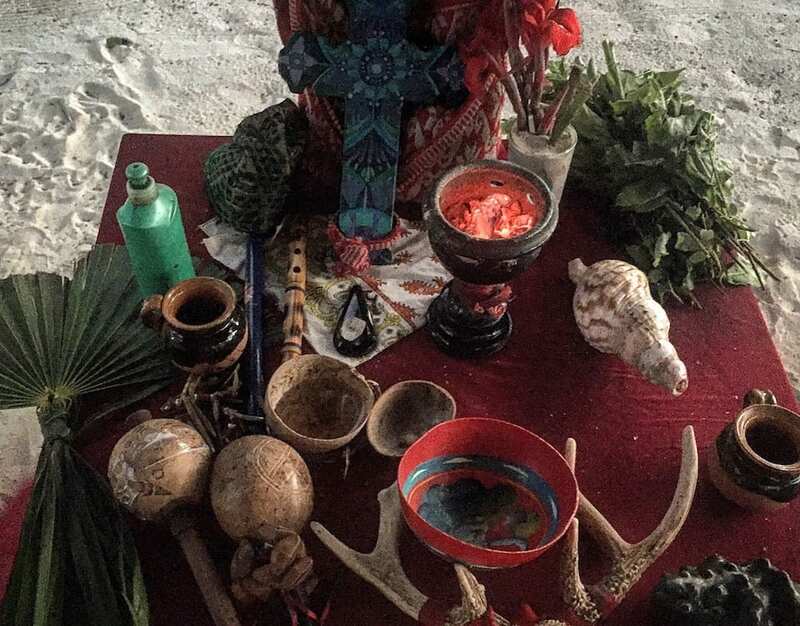 Though I’ve been to Tulum before and considered the ceremony each time, I knew on some innate level that I was not fully prepared. I wasn’t at full capacity to put my ego aside—to be cracked wide open and allow myself to be vulnerable. But for whatever reason, I was now ready. It helped to have several empowering and inspiring women by my side, despite having only met them a few days prior on a retreat. So I led the charge and encouraged them to come with me, this time, at an ecological resort with a full traditional Mayan ceremony. I even forewarned them that it was not for the faint of heart, but perhaps this was for my own reassurance. And funny enough, the fear crept up anyway as the ceremony drew nearer—and so I planned to position myself close to the escape hatch once again. It’s interesting how despite becoming aware of our old patterns, we continue to repeat them anyway. A ceremonial Mayan altar for a Temazcal in Tulum. When the moment arrived and we stripped down to our bare essentials, our shaman, a young fellow named Demetrio adorned in feathers and colorful garb with a calming, jovial demeanor, had us gather around an altar to pray before going inside. Understatedly wise beyond his years, he summoned the four directions in his mother tongue and the corresponding four elements: Earth, Water, Air, Fire, and blew into a large conch shell horn as though it were sounding a mating call to the cosmos. We walked over to the fire where the stones were heating up, and threw in pieces of crystalized copal resin, sealing our intentions—and our fate. By then I found myself in a sort of meditative, waking trance, and as we lined up to enter the hut one-by-one, I no longer cared where I sat. And what do you know, I ended up right back in that very same place where I first began my Temazcal journey: at the very back, the furthest from the door. I stayed there, I sweat, I smiled, I even cried. I had never been so happy and present; never felt so much at peace. As we sang and chanted along to the steady beat of a drum in words that I cannot remember, in a language I do not even know, there was a certain familiarity about it all as though we’d experienced it before. Full disclosure: by the final round of that sweat I was in such a deep meditation that I did not realize my heart rate had overly-accelerated. Having noticed this, the shaman asked me come closer to the door. This was not a defeat because he invited me there. As I laid down on the palm tree fronds on the cold, damp earth, he kissed me on the forehead and my body temperature regulated. I did not flee; I did not panic. And I did not need to prove to myself that I could handle the heat. Temazcal is not about punishing ourselves with extreme endurance so we can repent for our sins. It is about opening up to receive ancient spiritual medicine—to move past the point of resistance so we can heal past wounds and hurts; to bring all that stuff we’ve spent our lives suppressing to the surface and offering it up to the universe for release. It is about bravely stepping out of safety and forward into growth, and leaving our fears in the dust. Andrea Rice is a Senior Writer for Wanderlust Media. 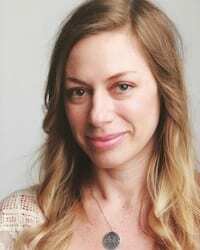 She is also a freelance writer, editor, and yoga teacher. Her work has appeared in The New York Times, Yoga Journal, SONIMA, mindbodygreen, AstroStyle, and other online publications. You can find her regular classes at shambhala yoga & dance center in Brooklyn, and connect with her on Instagram and Twitter.